ST. GEORGE – Future water stability and its economic impact on Washington County was the chief topic of discussion during the monthly CIRPAC meeting of the Washington County Water Conservancy District. CIRPAC, or the Community Integrated Resource Planning Advisory Committee, is a group that represents county, municipal, business, environmental and citizen interests to help guide the future of water resource planning in the county. The committee meets the fourth Thursday of every month at 4 p.m. at the WCWCD building. This month’s meeting featured Jeremy Aguero of Applied Analysis out of Nevada, whose company had been hired by the water district to determine the economic impact of water resources on the county moving forward. Before Aguero addressed CIRPAC members and the public gathered at the meeting, WCWCD General Manager Ron Thompson gave short remarks concerning present and future projects the water district is undertaking. These projects are needed in conjunction with continued water conservation practices, he said. “Conservation and water development are crucial to meet the future needs of the county,” Thompson said. 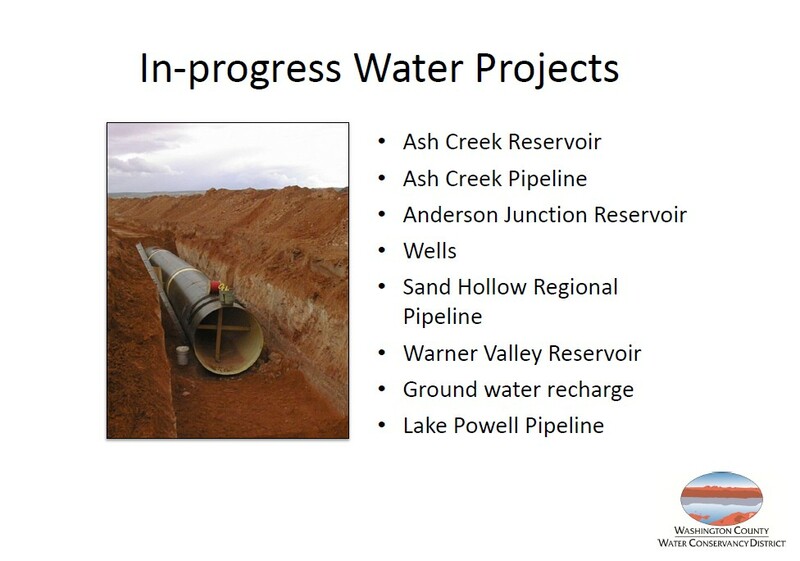 It is also projected that Washington County will have developed all of its water resources by 2020 without the inclusion of the Lake Powell Pipeline. “Washington County has a finite amount of water resources currently available,” Aguero said, speaking of the Virgin River. Aguero said Utah is currently ranked fifth highest in the nation for population growth. Within Utah, Washington County is ranked third in growth. People are moving to Utah, and more particularly Washington County, for jobs and retirement – the two primary reasons people choose to move in the first place, he said. “I’m an analyst, not an advocate,” Aguero said at the start of his presentation. According to his company’s analysis, Washington County currently has 74,600 acre feet of water available. This sustains a population of 154,000 people who use an estimated 45,683 acre feet of water. If current demands on the water supply remain stable for the coming years, Aguero said the county’s water supply will reach capacity by 2031. “2031 is not that far away,” he said. However, if population growth shoots up – and Aguero believes it will as time passes – the water will run out faster. He gave an example of a 3 percent increase in demand on resources based on a 6.5 percent growth rate – at that rate, the county would reach capacity in only nine years. 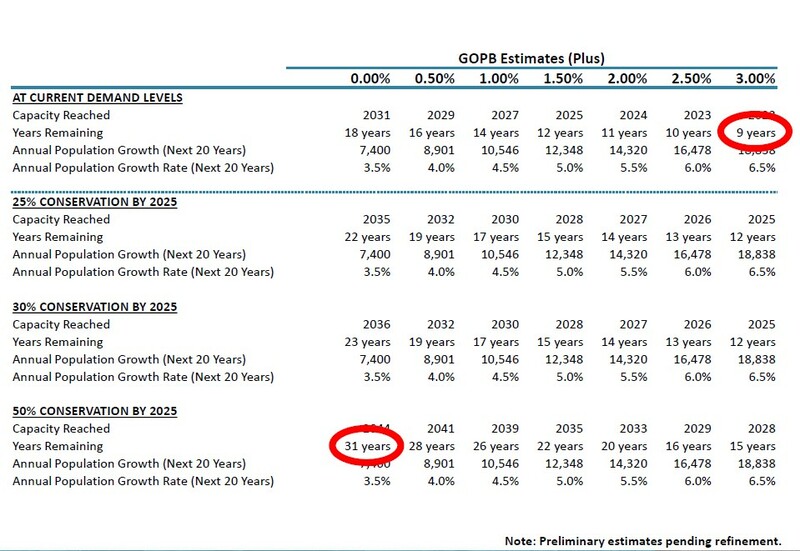 While Aguero acknowledged the number was an extreme, the numbers he finds more realistic hit the county’s water capacity between 12 and 14 years from now. And what of conservation efforts? Even in an extreme case, such as restricting water use by 50 percent, it only preserves water resources for 31 years, according to Aguero’s data. 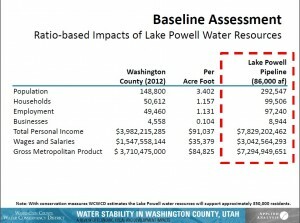 Water instability: Is the answer the Lake Powell Pipeline? As water resources are projected to reach capacity in the future, a new means of securing the area’s water stability needs to be devised. 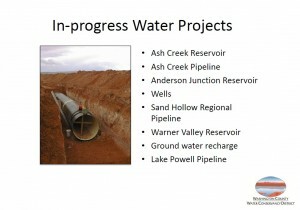 Aguero began to remark on the Lake Powell Pipeline, a subject that has its fair share of supporters and detractors. The pipeline is estimated to take at least eight years to build and has a $1 billion price tag. The thing about water, Augero said, is that if there is a perception that Washington County can’t sustain itself, growth will lessen, and with it, future economic benefit. “From an investor’s point of view, potential water resource instability and actual water resource instability are essentially the same thing,” he said. Sources of capital and operating funds for the pipeline are likely to come from impact fees. Economic benefits of the pipeline? So what does a $1 billion bill of capital investment do for Southern Utah? Aguero said preliminary impacts include the creation of an estimated 10,000 jobs per year revolving around the pipeline’s construction, wages to those workers amounting to around $425 million, and an output, or return into the local economy, of $1.5 billion. With the pipeline and conservation efforts, it is projected that Washington County will be able to support a population of up to 350,000 people. The pipeline may be “vital to the protection of the (local) economy,” Aguero said. It would provide water resource stability, something those considering relocating to the community like to see, as well as diversify that resource beyond the Virgin River. Not everyone is thrilled with the idea of the Lake Powell Pipeline due to the price tag attached, as well as the belief that the Colorado River, which feeds Lake Powell, is an endangered resource. “The Virgin River is finite – so is the Colorado River,” CIRPAC member Christi Wedig said. Wedig represents Citizens for Dixie’s Future, a conservation and environmental awareness group. CDF maintains the Colorado River is already over-allocated and shrinking. They have also said in the past that the actual cost of the pipeline will be closer to $2 billion. “(The pipeline is) a dangerous proposition,” she said. During a Q-and-A session following the presentation, concerns over the pipeline’s potentially negative effect on impact fees were also submitted to Aguero. Impact fees on future construction is one of the primary ways proposed to help pay for the pipeline. With such a high price, worries were expressed that future homes would become too expensive to build, thus killing new growth. A worry that property taxes utilized by the water district would also be hiked in order to help pay for the pipeline was also expressed. Aguero said it wouldn’t be smart policy to have impact fees and property taxes skyrocket. High property taxes would be a “direct extraction out of the economy,” he said, and that it wasn’t a good idea. Impact fees and property taxes need to have a balanced approach, he said. 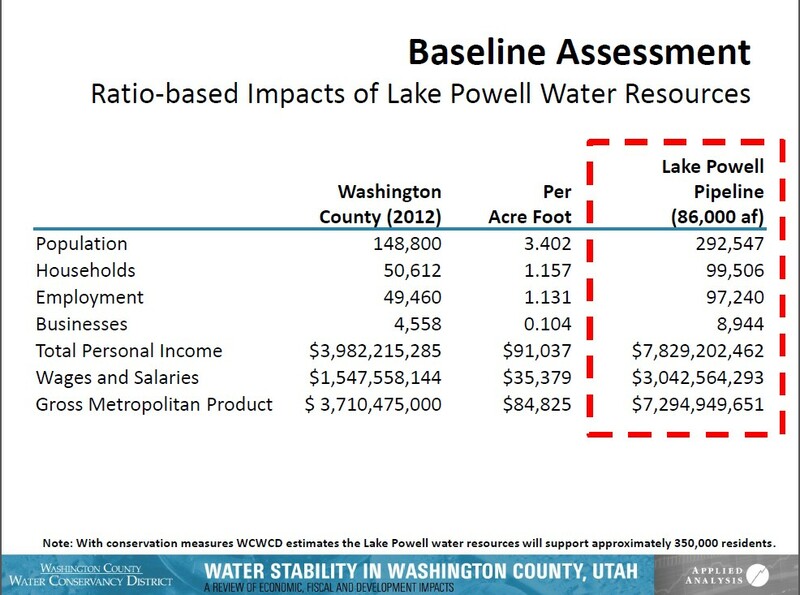 The presentation given at the CIRPAC meeting was only the first part of an overall analysis of the economic impacts of water stability on Washington County. Though a solid date has not yet been set, it was anticipated that Aguero will address the committee again with an analysis that will go more in depth on the impact fees issues and other matters related to the water district and county. 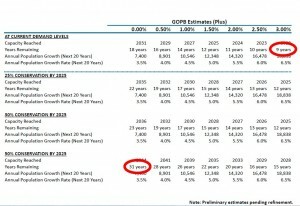 Pipeline jobs will bring $1.5 billion?! Let’s build two. only way to bait those retired people is with golf courses. 300 million gallons per year per course time the 23 we have around here? do the math -it isn’t the homeowners using up all the water. it’s the developers (getting wealthy). Funny, all the Golf courses and parks I know of are irrigated by the Alkaline wells that are non-potable in the area. Same with a lot of the Agriculture around here. Can’t drink it, but it does make plant’s grow. “Washington County has a finite amount of water resources currently available,” Wow, that’s brilliant! I’ve got news for you Mr. Aguero. Every place has a finite amount of water resources. Even after construction of a pipeline, we will still have a finite amount. How about smarter use of water? I understand that Utah is one of the few states where reuse of gray water for landscaping isn’t allowed. Could Washington county enact a law to allow reuse?